Often called physical chess, fencing is considered a mental game as well as a physical one. Comal ISD students are paving the way for the future of the sport in public schools. While fencing is not a UIL sponsored sport, it has become an important part of Comal ISD's intramural sports and now boasts teams at Memorial Early College High School and Canyon Lake High School. In fact, these teams have made quite a name for themselves across the state winning individual and team honors with three of them qualifying for the Junior Olympics. On Saturday, April 6, the MECHS team took first place in the team Foil event at a high school tournament in Dallas while two members tied for third place in the same event. MECHS Juniors Austin Kortz and Kyle Kistner along with Freshman Jeremy Clar won first place in the Foil event for their team, and Kortz and Kistner tied for third place in the individual Foil event. 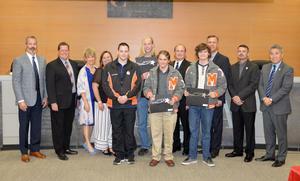 During its March meeting, the Comal ISD Board of Trustees honored these athletes for their achievements in the sport. MECHS Junior Mason Moya, Kistner and Kortz were honored for qualifying and competing in the Fencing Junior Olympic Championship Feb. 15-18 in Denver. They began learning the sport three years ago as freshmen at MECHS with the guidance of their coach, Jim Basler, and faculty sponsor, Richard Muenich. 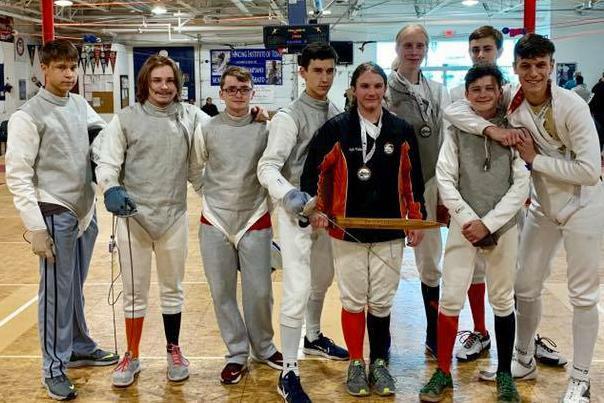 With only a few public high school fencing teams in the state of Texas including MECHS and CLHS, the district is helping to build a program from the ground up. Finding tournaments in which to compete with other high school teams can be difficult which is why Comal ISD hosted the first public high school fencing tournament in Texas at Church Hill Middle School on Oct. 6, 2018. Four schools competed including MECHS, CLHS, Boerne High School and Tarrant County Community College, an early college high school. Often called physical chess, fencing was one of the first sports to be played in the Olympics. Considered a mental game as well as a physical one, in fencing, the winner outsmarts the opponent. The sport takes balance, muscle control, quick movements and instincts. -Comal ISD fencing teams from Memorial Early College High School and Canyon Lake High School competed in a Texas high school fencing tournament in Dallas on April 6. 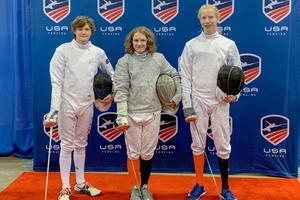 -Pictured from left are Memorial Early College High School Juniors Mason Moya, Kyle Kistner and Austin Kortz who qualified and competed in the Fencing Junior Olympic Championship in February in Denver. 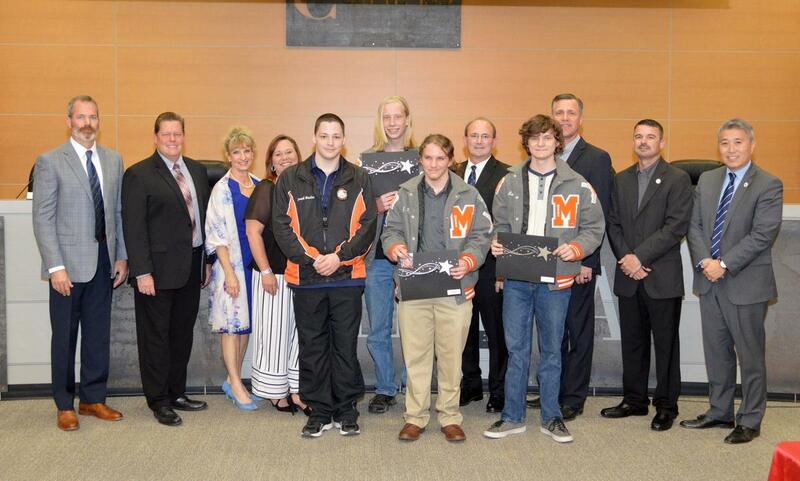 -Members of the MECHS fencing team were honored by the Comal ISD Board of Trustees during its March meeting. Read more CISD news here.